The future is back! At least for the next year. The BBC has launched a year long season of science and technology programming under the banner of Tomorrow’s World. It’s a familiar name to those of us of a certain generation. 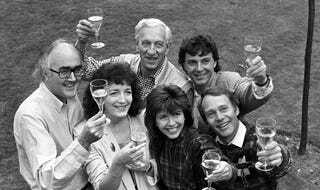 Between 1965 and 2003, Tomorrow’s World was a tv show where the likes of Raymond Baxter, James Burke, Judith Hann, Maggie Philbin, Michael Rodd and Keiran Prenderville and others brought us the latest in invention and innovation - hovercrafts, heart surgery, paint that could protect an egg from a blow-torch, early computers. It was the Click of its day, but primetime telly rather than the outer reaches of the BBC News channel. The new Tomorrow’s World still aims to take science out of the lab and into the home. It seeks to address how science is changing lives, reshaping the world, and rewriting the future of healthcare. “Our aim is to make science personal with the biggest scientific partnership we have ever convened to answer the big questions relevant to everyone,” says the Beeb. Tony Hall, BBC Director-General, adds: “We’ve come together behind a simple, and very bold ambition - to equip all of us with the knowledge and understanding we need to make sense of our lives and the future. Whether it’s the rise of robotics or the demise of antibiotics, travelling to Mars or the arrival of 3D printed food. Science is changing the world at an extraordinary pace. To engage people who want to know more and debate these topics, the digital hub at www.bbc.co.uk/tomorrowsworld, will feature a range of content made by the BBC and partners. The digital space will bring the most respected science institutions from across the UK together. Curated daily, it will reflect interest in the broadcasts, topical events and social media. The hub will also offer short films, a series of citizen science opportunities to engage with the audience, interactive calculators and other interactive features. The content will take the Tomorrow’s World themes such as contagion; artificial intelligence; sleep; and use science to help people better understand themselves. There will also be Twitter Q&As with some of Britain’s most eminent scientists; online debates about the biggest scientific questions of our time; and a Facebook community where even the most colossal concepts are accessible, relevant and personal.